I am a standup comedian. Last Tuesday, I attended the British comedy awards, my first since 1991. Today an edited Channel 4 highlights package from a Wembley warehouse, back in ’91, in their second year, the awards were a primetime ITV Saturday-night live spectacular in a big South Bank studio. I wrote for Radio 4’s On the Hour, which was up for best radio comedy, a category which, like best live comedian, has now been dropped to make space for TV faces. Broadcasters are no longer required to honour their general arts coverage remit, so there’s more time for revenue-generating film of newsreaders eating insects. Slaves, rattle your chains. Are you all enjoying your new freedoms? What a difference 23 years makes. I was working the next two times I was up for British comedy awards, nearly two decades later, and absconded. But people had raised money for the rights to release the third series of Stewart Lee’s Comedy Vehicle commercially, which was nominated this year, so I thought I should go, as it’s hard to make the stake back in a world where the public expect to steal all content for nothing. Besides which, I have become the sort of person who declines to attend events on principle, but where my absence is not noticed anyway. When I won two British comedy awards in 2011, it wasn’t mentioned in any newspapers. And my 2012 Bafta acceptance speech was cut from TV, perhaps because I told the presenter, Kate Thornton, that acclaim was a random phenomenon, like cloud patterns, into which you read significance at your peril. Nonetheless, the thought of going to the British comedy awards was terrifying. In a possibly psychosomatic state, the flesh on my lower left leg had taken on a play-dough texture, and I could move it around in clumps beneath my skin. Could the thought of having to sit alongside celebs I’d done routines about have brought this on? Or was I a new kind of human, like Sir Ian McKellen or Janelle Monáe? Then I thought, what if I don’t go? What if I sent a different version of myself instead, more confident, better dressed? They got to my categories, best male TV comic and best comedy entertainment programme. Lee Mack got the first, and Graham Norton the second. And I realised I’d been lying to myself. Through a mixture of indefensible arrogance and mathematical logic, I had assumed, without acknowledging it, I’d win both. I’d won both for the second series, three years back, and the third series was demonstrably better than the second, so what had changed? Don’t misunderstand me. I don’t think for a moment I am the best standup in Britain, and if this was an award for live standup, and I was up against any of the hundreds of inspirational acts I see on the live circuit, then I would never have been arrogant enough to assume that I deserved anything. But this was TV standup, live standup’s idiotic attic-bound relation, and a world through which I soar like a mighty eagle through a cloud of diseased gnats. Lee and Graham accepted their awards on video. My acceptance speeches, which I realised with a sudden regretful surge, I had composed unconsciously in my head that week, had things positive and not untrue to say about the other nominees, but Lee said nothing and Graham said he didn’t even know who he was up against. I was shocked. I realised I had convinced myself I was here to help the DVD investors, but I had been entangled by vanity and ambition. I had chosen to attend the British comedy awards which, once attended, could not be unattended, like the worm-ridden dog egg in the infant school playground which, once seen, cannot be unseen. There were six people on our table. The bottle of red had disappeared, and with it my cowboy-Indian creation. I had turned to pear cider in search of answers and soon I was me again, fearful and drowning. The button popped on my rodeo shirt. It wasn’t mine to wear. Jack Whitehall won king of comedy for the third year running, and I found myself shouting out “shame!” and, inexplicably, “class war!” When the filming ended people started asking me to do interviews, but I growled them away because he’d gone and I was just me. I couldn’t find my wife and descended into a kind of prima donna panic attack, like the husband in The Vanishing, and then we grabbed a cab, the last helicopter out of Saigon, and got home and watched a 70s George Carlin DVD, and in the morning my zombie leg was human again. On Wednesday, I went to do a benefit show at the Bloomsbury. None of the standups there were even aware the awards had happened, and when I saw the TV coverage later that night, my shouting had been surgically erased and vast swaths of the night seemed unfamiliar. Was Danny Dyer, who suggested slashing your errant girlfriend’s face with a knife in a lads’ mag agony column, really invited to hand out best comedy entertainment programme? My mind was blank, as if I had shut down, like the mice in our hallway that go catatonic as they wait for the cat to kill them. 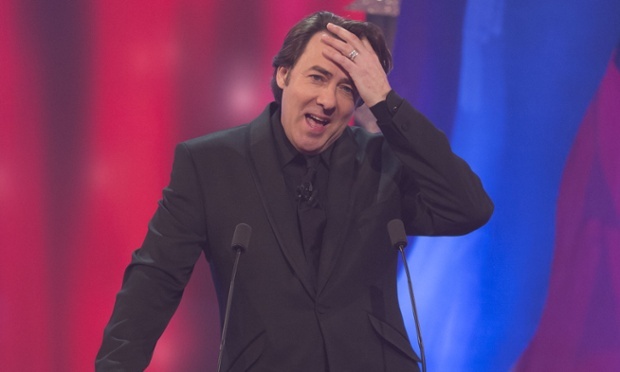 It seems unlikely there will be another British comedy awards. In the end, they chased the capricious populist audience with their phone-ins, even as the former award-winners’ votes drove them towards neglected gems such as Toast of London, and ended up in a curious no-man’s land between Nuts and the Independent on Sunday. Even Jonathan Ross couldn’t save them. It was interesting to attend twice, a quarter of a century apart. But I know now that I will never, ever go to anything like that again. Maybe the bounty hunter will come out of the wardrobe. I’ll need to lose some weight to get into his trousers. Good. I could do with looking after myself a bit. I’m in this for the long haul. There are no short cuts.